Last Friday, I informed a friend that I would no longer be in the business of baking cookies. They don’t ever turn out perfectly; they’re either too crunchy, flat, or mushy, I told her. Maybe I should start baking cookie bars instead? 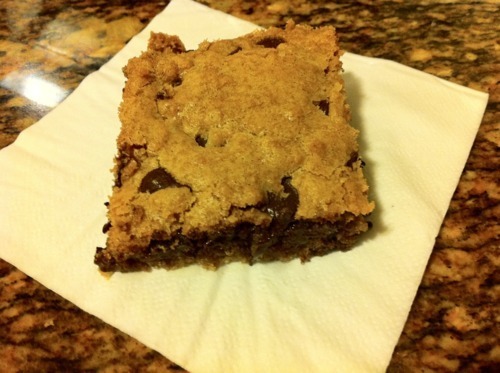 As I love reading blogs, I soon went on my Google Reader and saw a post from Two Peas and Their Pod for Chocolate Chip Cookie Bars. I texted my husband and told him I had discovered a recipe for cookie bars and I was thinking about making them that night. Seeing as how he loves chocolate chip cookies, he was happy! Since it would only be the two of us eating the cookies, I chose to cut the recipe in half. I used white whole wheat flour as a substitute for the all-purpose flour and extra virgin coconut oil instead of the butter (except for about 1 tablespoon). Coconut oil has recently been getting a lot of press as it is better for you than using regular oil. Katie who blogs at Kitchen Stewardship has a really informative post on coconut oil's health benefits. They turned out to be delicious! The cookies were the perfect texture: soft, yet a little crunchy, with gooey chocolate chips. I would definately recommend trying this method of cookie baking. It saves time and cleanup. Have you ever tried baking cookie bars?